I’m always looking for a new breakfast recipe. I feel like we run out of options besides eggs for breakfast pretty quickly! And now that baby girl can’t have eggs, it has made breakfast that much harder. Over the weekend I did make the Oatmeal Bake which has been a hit in this family, but just left out the eggs and decreased the water by ½ and it turned out great! We all liked it and we all could have it. The[amazon_link id=”B000KNB0OW” target=”_blank” container=”” container_class=”” ] steal cut oats[/amazon_link] aren’t really paleo, but they are a better option that the rolled oats and are gluten free for hubby. I love oatmeal and feel like it is still a healthy option for us in the mornings. I’ve also noticed that the kids are satiated for longer and often don’t need a snack when they have oatmeal! That is a huge plus here. Usually the boys are saying they are starving every 10 minutes, or so it seams! 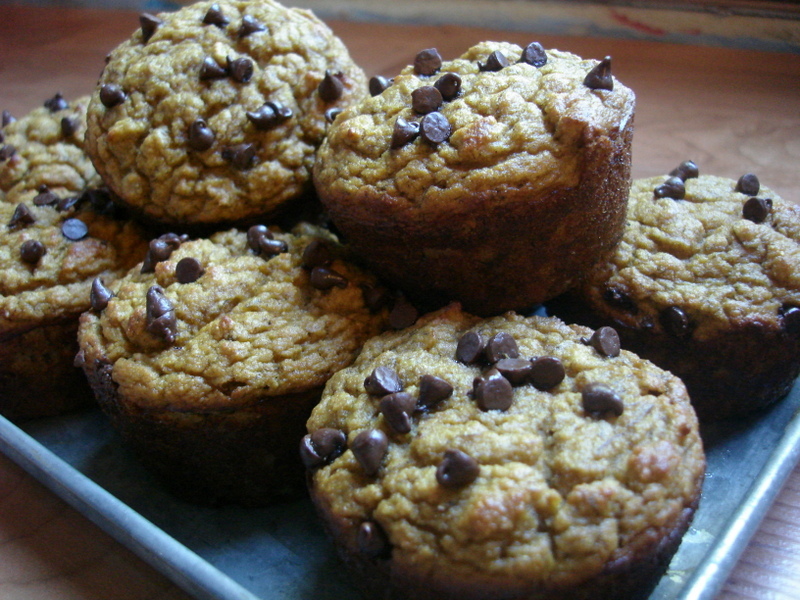 This recipe for banana muffins is great. I often have bananas that are getting soft and that they boys prefer not to eat since the skins are getting dark. If I push, they will eat them, but sometimes it’s nice to have a few muffins instead! Hubby can have these as well and they freeze well and are easy to reheat! The boys see these as a super special treat as well since they have chocolate in them and they get them for breakfast! I found the recipe from Multiply Delicious which is a great Paleo website with all kids of great recipes! Preheat oven to 400. Line a 12-cup muffin pan with paper liners. In a large bowl, combine eggs, coconut milk, maple syrup, sea salt, and vanilla extract. Whisk to combine and set aside. Sift coconut flour, baking powder, baking soda, and cinnamon into the wet ingredients. Whisk vigorously until no lumps remain. Stir in melted coconut oil until well combined. Fold in banana and chocolate chips until incorporated. Using a large ice cream scoop, add one level scoop to each muffin cup. Sprinkle each muffin with a few additional chocolate chips. Bake muffins for 15 to 18 minutes or until muffins are golden and spring back when pressed gently. Once baked, cool for 10 minutes.